No events without you! Your curiosity, your stories, your laugh bring our events to life! You are the heart of our community and you make our events a great experience! Join us next Saturday for Networking & Party! 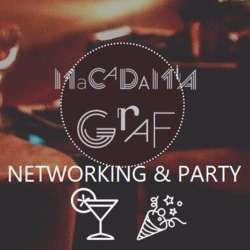 Enjoy the elegant lounge of MACADAMIA to get to know expats and global minds from all over the world and take part in one of our speed networking sessions if you fancy a more structured way of making new contacts. - Hit CLUB GRAF (on the same floor!) from 23:00h on and make the party happen! Saturday night is yours!